Primary – Dual 13 MP, Laser and phase detection AF, Carl Zeiss Optics. 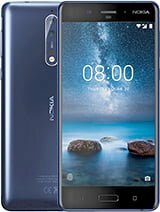 Nokia 8 is a great smartphone that comes with Latest Android 7.1 OS. This device has 5.3 inches IPS LCD Display with (1440×2560 pixels), Octa-Core CPU, Adreno 540 GPU, 4 GB RAM, Dual 13 MP, f.2.0 camera, and 13 MP f/2.0 front camera etc. This device price around 44.000/- BDT.